The wife and I are planning to go on our very first trip to Disney World with our daughters next summer. And I must admit, starting the research on this place is quite intimidating. Meal plan? Days to purchase on the hopper ticket? Water parks? Everything at Disney World is attached to a price. And my favorite price when speaking to someone about the trip? Paying a bit more for a room towards the front of the hotel, which she assured me, would help immensely at the end of the day. Forgive me if I find that uniquely absurd, but really, how big is this hotel, much less the park? I can only imagine going to Disney World in the summertime, only in a year I won’t be imagining a thing – the heat, water bottles, and the $16 mugs at refilling stations are waiting for us. I mean what is the appeal of a vacation where you need to have a follow-up vacation to recover from the vacation you just took? What was it about Disney World that appealed so magically to Adelaide, Gil’s mother in TheatreWorks Silicon Valley’s dynamic dark comedy “Wild With Happy,” now running at the Mountain View Center for the Performing Arts. Gil might not have fully understood the appeal of the park, but he understood his mother. In her apartment, of the items left after she passed, Gil only wanted one thing – a doll, a porcelain Disney classic replica of Cinderella. Disney World was not just a destination in Florida for Adelaide. It was a world that made her a beautiful shining princess, one where she wore the perfect glass slipper made for only her celestial toes. And no matter what criticism came down from whomever in regards to honoring his deceased mother, Gil was gonna do right by her no matter what. 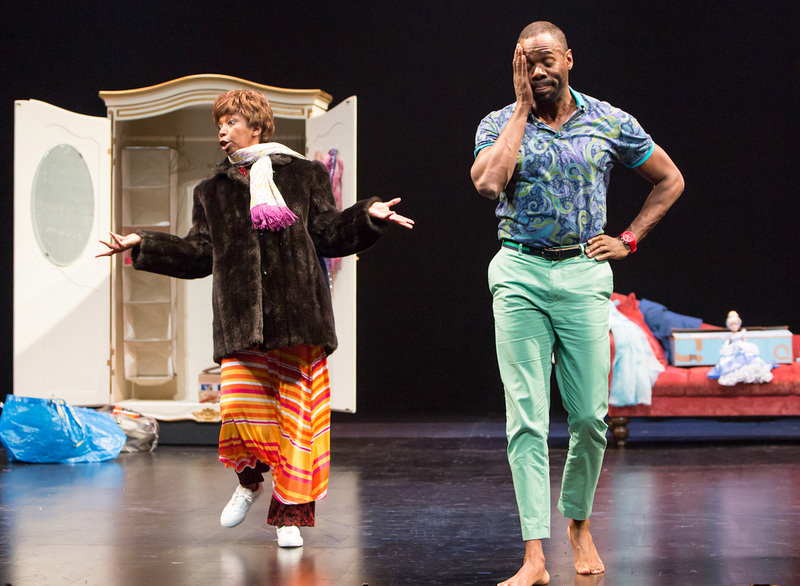 Colman Domingo’s absolutely pulchritudinous script is placed in the hands of an exquisite ensemble cast, led by Domingo himself and smartly directed by Danny Scheie. Although this is not constituted as an autobiographical piece, it resonates as something deeply personal. There is a certain reverence in the script for each of the archetypes represented in the play – the ethereal mother Adelaide and her quirky sister Aunt Glo (a phenomenal Sharon Washington in dual roles), the fourth Terry Jackson (a sharp turn by Richard Prioleau), loyal friend Mo (joyously portrayed by Duane Boutte), and of course the 40-year-old gay African-American Gil (Domingo), who returns to Philadelphia and works feverishly to make sure his mother has a proper send-off. The show starts off a little slow, yet still somewhat compelling. There is a funny scene that does well to establish Gil’s disdain for organized religion. And there is the obligatory exposition in a funeral home, full of the surreal intricacies of looking at caskets and the realization that dying is crazy expensive. There is some comfort by the fact that Jackson number four is happy to share some much needed love with Gil. The play truly heats up with the arrival of Aunt Glo, who bursts onto the stage with grief that is both organic and trite. Wailing over the death of a relative while loading up a bag full of said relative’s items from the closet gives that impression. But where Aunt Glo is the most critical is in what she represents. She’s the sister, she wants to gather together with others, she wants to mourn and cry in a church, because that’s what people do. And she will hear none of this cremation nonsense. But Gil takes on a much more pragmatic approach. Gil wants what would make his mother happy. It is a paradox which the play explores marvelously – when someone dies, is it truly about what they want, or what we need as the people who are continuing in this life? While the ensemble cast was truly marvelous in their unabated joy, Washington is a gem, constantly making the audience giddy with glee. Her crazy nuances, from popping blood pressure pills like they were breath mints to having some wildly illogical observations on the duality and functionality of Mexicans were both hilarious and insightful. Washington also moved seamlessly between two characters. Domingo’s script is greatly enhanced by Scheie’s direction, which is broad in scope. Scheie pulls out many intricate stops to tell this story, using tactics that reach across a plethora of directing styles. His direction is further enhanced by a great scenic design by Erik Flatmo and David Lee Cuthbert’s fully textured lighting design. With all of the wonderful insights made in the play, one stayed with me as I plan this foray into a whole new world next year. In a beautiful fantasy world in Anaheim or Florida, where everybody can be a princess or prince charming, and where every parent can become a cynical curmudgeon with each nine dollar cheeseburger, the Disney magic is summed up succinctly by Adelaide. “In this place, they have parades on the hour, just to be happy.” It’s an important lesson to remember, which makes that park, and so much of this play, simply magical. The Word: A wonderful script, and a standout performance by Washington, makes this a wonderful ride about the love and loyalty of a son.